A blast from the past—were you a hippie or flower child? Relive the fun. The best dressed hippie or flower child wins a prize! Food, Drinks, Raffles, and Fun for everyone. Come join us and meet Pam Oakes, Candidate for Honorary Mayor of Land O’Lakes. The Lint Rollers will be playing and paying tribute to the good old days. They are awesome, just close your eyes and go back in time! Bring your lawn chairs or blanket and enjoy the sights and sounds. Great food and drinks are available to purchase from local vendors in Pasco—choose your favorite or eat it all! Sorry, no pets are allowed for this event. To learn more about Pam, her campaign issues and about the Honorary Mayor’s Race, visit http://pamoakes.com. 100% of donations & proceeds go to the Central Pasco Chamber of Commerce, with 10% earmarked for the Honorary Mayor’s choice charity. 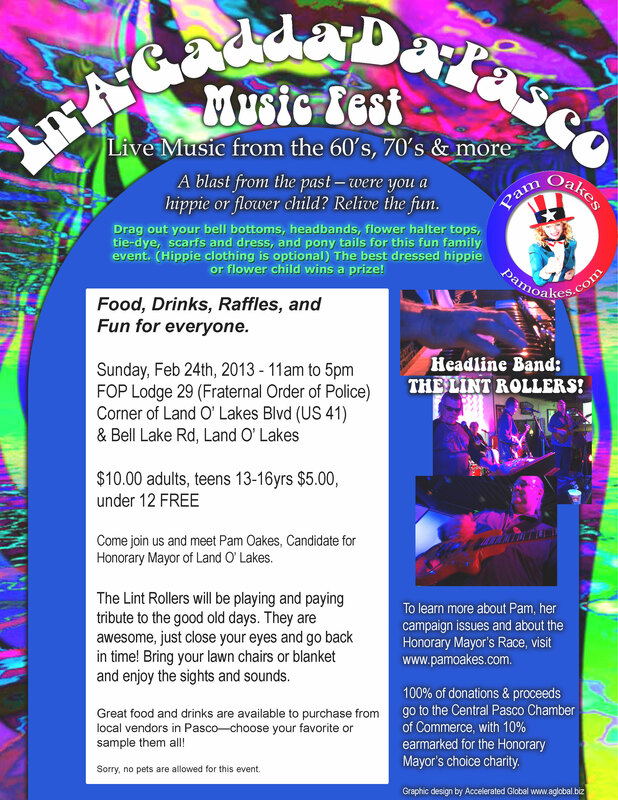 Enjoy Live Music from the 60’s, 70’s and more at this outdoor concert event supporting Pam Oakes, candidate for Honorary Mayor of Land O’ Lakes on Feb. 24, Sunday, at the beautiful facility at the Fraternal Order of Police (FOP Lodge-29) on the corner of US 41/Land O’ Lakes Blvd and Bell Lake Rd. The Event starts at 11am and will continue to 5pm with food, drinks and merchants from local vendors, prizes and fun for everyone! All proceeds go to the Central Pasco Chamber of Commerce in this fundraising event. $10.00 per person, Children under 12yrs old accompanied by parent free, children 13 yrs to 16yrs accompanied by parent $5.00. It will be a great afternoon for the whole family! Bring lawn chairs or a blanket. Click on the poster to enlarge. For a lighter version suitable for printing brochures, click here. The old-timers on the Lansing (MI) Fire Department will whimsically recall this new recruits uniformed a** (literally! ), up in the air most mornings, bent over the big trash bins, digging through, picking out the recyclables. It was before curbside recycling service and big fancy bins and such (1983). I eventually placed and maintained recycling containers (cardboard boxes) in all 9 fire houses. Now, LFD has curbside recycling. And you do too! Pasco County Recycling Coordinator Jennifer L. Seney, FMN, FMG reminds us all to “Curb Your Blues”. Not that it isn’t excellent and timeless advice, but she’s not referring to putting your depression on hold. Moreover, she’s encouraging us to use those attractive Blue Bags for curbside recycling. Thanks for all that you do, Jennifer, and of your tireless Pasco County Utilities Fiscal & Business Services Department teams over there in New Port Richey. Thanks also goes to Eric Keaton and Ed Caum of Pasco County Tourism Development Office, who just today at the PascoCounty.com/7th Annual Tourism Summit reiterated the close link between tourism and maintaining a pristine environment. Some statistics show that for every 82 tourists, 1 job is created. But what kind of impact does that same amount of visitors have on the environment? Theodore Roosevelt once said “Conservation means development as much as it does protection, but the nation behaves well if it treats the natural resources as assets which it must turn over to the next generation increased, and not impaired in value.” So, in addition to awareness and education on the subjects of Tourism and Naturism, the Environment will be a concurrent theme during my tenure if I am elected as Honorary Mayor of Land O’Lakes and for the multitudes of trips around the sun into the ever after. I would propose to Jennifer that we work closely to understand, and perhaps, take the lead in managed growth as it relates to the tourism industry. What are they doing over there in Polk? I’d like to hear how they’re handling these types of things. From what I heard at the Pasco County Tourism Summit today, I gather very well. Kudos to Eric and Ed for an all-star line-up again this year. It’s my 3rd Summit. I enjoy seeing faces, known and new, and come away with new perspectives on a myriad of complex subjects concerning tourism. Each year very different, and always informative. Eric and Ed say good-bye to our beloved Colleen, and a cheery hello to their new assistant, Audrey. Her inaugural Summit, Audrey’s performance was a stellar display of efficiency and good old fashioned Southern hospitality . Friendly as a puppy, I think she is happy to have found a new ‘home’. Best wishes Audrey! A Pam Promise: I will make every attempt to offer recycling at any events that I organize and encourage others to follow Pasco County’s commitment to the environment. 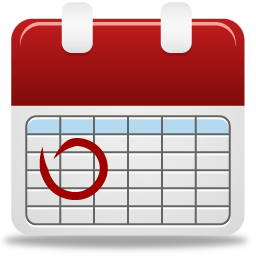 See HOW TO OPTIMIZE RECYCLING AT YOUR PASCO COUNTY EVENT. As a regular Nusa SUN Magazine contributor for 2 years, my column, What’s Up Now Pam? chronicled my journey from a rambunctious youth to a trailblazing firefighter. Also, the how, when and why I adopted the naturist lifestyle nearly 20 year ago. 20 Easy to Prepare Delicious and Nutritious Recipes for the Au Natural Chef in YOU! This Special Edition of Nusa SUN Magazine is a collection of my favorite What’s Up Now Pam? columns as Nusa’s Health & Fitness writer Nekkid Chef. Witness my personal transformation from premature poor health to optimal health as I ‘bare’ my soul through my humorous take on life and epicurial anecdotes. Beautifully illustrated color photos, I impersonate over a dozen famous females of stage, film and history! ‘What’s Up Now Pam?” was a popular column in Nusa SUN Magazine from 2010-2012. As a Nekkid Chef, I’m currently on hiatus from my regular health & fitness column to pursue community service work as a volunteer for The Pasco International Tourism Committee (P.I.T. ), a subcommittee of the Central Pasco Chamber of Commerce. Nusa SUN has partnered with P.I.T. Committee to promote it’s international naturist tourism efforts and frequently features stories in this colorful and fun, informative and edgy magazine serving the largest nudist community in the world. Note: Pam is not a professional nutritionist or chef. Nusa SUN’s Nekkid Chef, Pam Oakes hands off winning tickets to an ecstatic Valerie Finch for a FREE Naked Hot Air Balloon Ride as witnessed by Jessica Warren of American Balloons on Hwy 41 in Land O’ Lakes. Valerie is a resident at Caliente and the owner of Tails A Waggin’ Pet Sitting Service. Pam ran the free offer contest during the summer sales of her Special Edition of Nusa SUN entitled The Best of Pam Oakes. Once a popular column in Nusa SUN, this Nekkid Chef will toss her chef’s hat into the ring and is announcing her bid for Honorary Mayor of Land O’ Lakes.